Hello and welcome to our adventure. On this adventure we will share with you beautiful beaches of our country by sailing with our own small sailing boat. We will also try to film as much as possible from the countless shipwrecks our country (more than 2000) and of course a wonderful underwater world. Follow our Sail and Under Adventures. Kosmas â€“ Dora â€“ JOY. 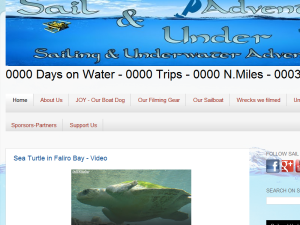 This what your Sail and Under Adventures Blog Ad will look like to visitors! Of course you will want to use keywords and ad targeting to get the most out of your ad campaign! So purchase an ad space today before there all gone! If you are the owner of Sail and Under Adventures, or someone who enjoys this blog why not upgrade it to a Featured Listing or Permanent Listing?